THE SKINNY: When it comes to food, green stuff is good for you. When it comes to facial wipes, green stuff is also good for you. 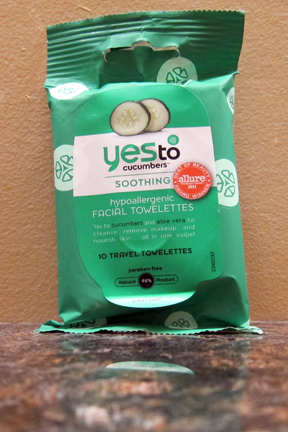 Made from cucumber, green tea and, yes, broccoli and spinach, Say Yes to Cucumbers' Soothing Facial Towelettes and cool and refreshing to my skin. I've used a lot of different facial wipes to remove makeup, and these rank among my most favorite. As you would expect from anything skin-related that uses cucumber, they are cooling and refreshing. They erased my makeup and mascara easily and left my skin feeling great. These wipes are biodegradable wipes, oil-free and hypoallergenic. KEEP OR TOSS: Keep. I do like the way they make my skin feel. CHECK IT OUT: These face wipes won an Allure Best of Beauty mention in 2011.